This will be an Out-of-Character (OOC) regular feature that allows me to briefly state my very personal views on the Star Wars Galaxies MMORPG. I haven't needed to shop for a new weapon or piece of armor for Force knows how long. I miss having a favorite shop to randomly drop into. He commanded immediate attention and respect, even moments free of the protective egg. Cyra Sedaris, more then a girlfriend and every bit the bio-engineer, had kept a watchful eye over his development for a full three days. The buttons and dials on the incubator's front panel were manipulated with expertise and experience; the temperature adjusted as needed and the proper, refined enzymes added to the process. 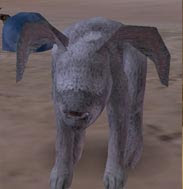 So there he stood, on the sandy lawn before the Animal Nursery on the main stretch, every bit as adorable as he was when he last roamed the roads of Laurus, Corellia, but stronger for being away for such a time. The little durni responded immediately to his name: Scruffy. Though not much higher then an ankle, he took to playing straight away, enjoying his tricks and surely life itself. 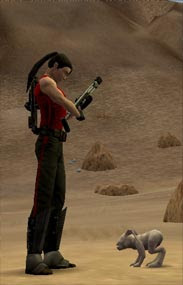 I lay on the sand in front of him, capturing the happy moment in a holo. Scruffy had come home at last. The grey-furred durni is not one to complain, but I knew he must be hungry for solid foods, having persisted on the liquid diet afforded by the incubation process. A proud and excited pet owner I may be, but I am no novice you should know. Breakfast would come later, for now it was time for action. So as not to overwhelm the little fellow (were that possible), we stole away to the outskirts of Mos Eisley to do the locals a service and rid the region of the pests and vermin. Scruffy, to my delight, put his large back legs to good use and ran down a worrt before turning on a womp rat. I was careful to not let him bite off any of their foul meat. The hunt was on, with a few unsavory swoopers getting caught in the "Scruffy crossfire", too! I was about to bring us back to the city proper, my legs aching from all the action, when Scruffy pushed up against my leg and leaned there; his personal way of telling me that he was hungry. Perhaps it was my own weariness speaking, but breakfast and a cushion sounded just the thing. The suns were both up now; there would be no time to be picky. Any food would do. I purchased some fruits imported from the Corellian Riverlands and held a piece out to Scruffy. He crinkled his nose a moment before accepting the meal. Hunger trumps taste buds, I suppose. Both he and I were happy as could be, united again at last. The heat intensified, and while the locals did not seem to mind much, Scruffy's fur was scorching to the touch. Mos Eisley may offer many things, but there is only one structure that can give me both shade and a stiff drink. It was a light crowd this early, or maybe it's normal as I don't often come to the Mos Eisley cantina these days. Scruffy and I passed a dancer in the main foyer and continued further in where the cooling vents could be better appreciated. I did not yet realize the error I had made. I randomly selected a dancer to watch (which just as luck would have it was my favorite colored variety of female twi'lek entertainer, even dressed to my liking! Imagine!) and prepared to settle in next to the cute little durni, who was already getting looks of adoration from the other patrons. I no sooner felt the heat of the outside retreat from my skin when Scruffy's hackles went on end and his posture turned as threatening as he could muster it. With his long ears flattened back against his head, he made to snap at the leg of the dancer. The cantina was cold, but Scruffy was hot with rage! I pulled the little, rumbling warrior up from the stone floor and whisked him away to the outside and straight for the starport that berthed my modified Y-Wing "ugly". Scruffy's growls subsided, but he was visibly annoyed from the experience. Not to worry. As I said, I am experienced animal trainer and knew just what to do to soothe the savage beast. I put in a comlink call to Oracle Base and asked for Ly'ssa, who had some skill with preparing some of the best and most exotic food you ever want. Ly'ssa was happy to oblige, I was pleased to find. In fact, she had already collected many raw ingredients in anticipation. By the time we entered the Lok orbit, she had already completed a full snack tray. Scruffy picked his way through sample after sample, never openly rejecting the tastes before him, but never allowing his demeanor to waver from persistent annoyance. Scruffy really did not like being near dancers! Finally, the finicky furball found a meaty meal that he liked. His hind quarters lowered and his posture relaxed; his ears flopped to the floor on either side of his face as he delicately tore off strips of meat and chewed them until it was gone. Animal handling is not hyperdrive science; don't allow me to ever claim otherwise, thank you very much. I stashed the rejected food in a cabinet in the local Watering Hole and decided that Scruffy had enough excitement for the day. We toiled around on the streets and eventually found our way back to the nursery where the little lad curled by my feet and rested. He was happy once more, and so was I because of that. Yes, Scruffy had come home. It was as if he never left.